MyGift Vintage Style Brass-Tone Metal Mirror Vanity Tray with 3-Compartments by MyGift at Frederick Douglas SMHA. MPN: DECO1164BAS. Hurry! Limited time offer. Offer valid only while supplies last. Elegant and functional this gold mirrored bottom jewelry tray is the perfect addition to any vanity, tabletop, dresser or retail display setting. 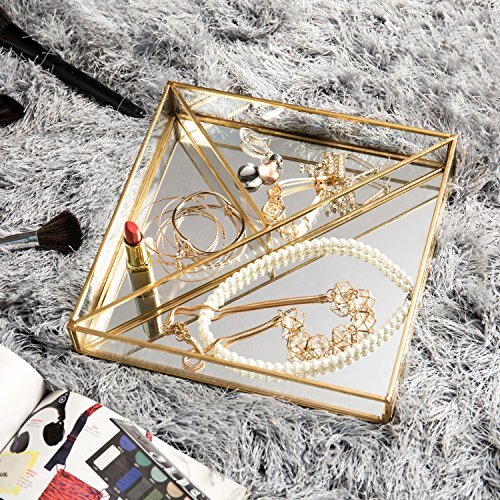 Elegant and functional this gold mirrored bottom jewelry tray is the perfect addition to any vanity, tabletop, dresser or retail display setting. Featuring a metal frame, mirror base and glass sides, this antique inspired box has been sectioned into three separate compartments, two small and one large, triangular shaped sections. The beautiful tray is ideal for storing jewelry, trinkets, crystals, collectibles and so much more. SPECS: 2.0 H X 9.8 W X 9.8 D (in inches). MIRROR SHADOW BOX: A brass-tone metal frame and mirrored base bring modern decor to any space. VANITY PERFUME TRAY: A unique way to display and store jewelry, keepsakes, trinkets and more. DECORATIVE JEWELRY TRAY: Ideal for organizing jewelry on your counter, tabletop, vanity or in a retail merchandise display. 3-COMPARTMENT: The square shape has been sectioned off into 3 parts to hold large and small items.